South Bank is an intriguing new residential resort community. South Bank is designed with boaters in mind. Waterfront. The epitome of property, in the Islands it conjures images of sparkling seas in shades shifting from turquoise to aqua to lime green. It means refreshing sea breezes, whether a gentle breath as languid as a puff of smoke or the steady tradewinds that act as natural air-conditioning. It brings to mind brushstrokes of pink dawns and red-orange sunsets gracing an ocean horizon. Waterfront real estate in the Turks & Caicos Islands has become far more limited than demand. With this in mind, Windward Development is creating communities to fill the gap in high-quality residential waterfront property on Providenciales. As the Turks & Caicos Islands glean award after award for the beautiful beaches, crystal-clear seascapes and a superb array of accommodations and activities, visitors and investors continue to seek new horizons beyond the renowned Grace Bay Beach. Among the latest to be discovered is the southeast side of Providenciales, marked by the straight-edge of Long Bay Beach and intriguing ironshore inlets. On this windward shore, you can count on steady breezes and views across the Caicos Banks, the shallow marine banks of the archipelago’s underwater plateau. 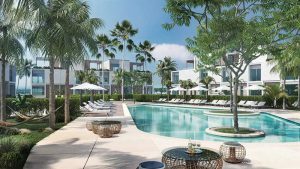 On the heels of their successful Blue Cay Estate project in Leeward, Windward Development is this Spring launching South Bank, a residential resort and marina community on the south side of Providenciales. According to Director Ingo Reckhorn, one facet of Windward’s approach to development is that “We like to take a piece of property and reshape it in the ideal way to enhance the waterfront experience for our buyers.” As a result, each neighborhood and lot at South Bank has been designed to have a unique relationship with the water, especially courting boating enthusiasts, watersports lovers and anyone with a yen for adventure. The Ocean Estate villas feature a contemporary design. 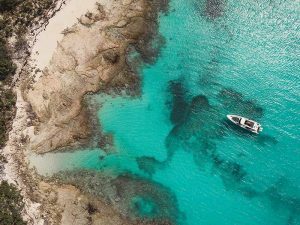 South Bank covers 31 acres to the east of the Caicos Marina with 230 feet of stunning beachfront along Long Bay Beach complemented by 2,000 feet of rugged and picturesque ironshore. Planned are 90 units ranging from six-bedroom beachfront and lagoon villas, to one-bedroom condominiums and townhouses with boat docks, divided among six distinct neighborhoods. The effect will be that of relaxed sophistication, featuring a contemporary design specific to the project. South Bank will include all the resort amenities expected of a premier destination, including restaurants, coffee shop and bar, pools, spa, gym, tennis courts and watersports. A testament to South Bank’s location, this will range from boating, sailing, fishing, kayaking, windsurfing, paddleboarding and most anything you could think of to get wet! In fact, the venerable Caicos Marina is being redefined and upgraded to best serve South Bank owners and Long Bay residents. The Long Bay Beach area is known for its large, prestigious beachfront estates. In keeping with this aura, South Bank will include two Ocean Estate neighborhoods. 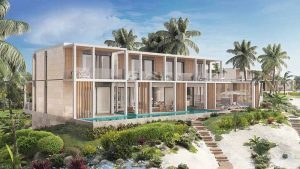 The four- to six-bedroom villas here are designed to seamlessly merge indoors and outdoor spaces, with walls of glass, oceanfront pool decks and courtyard terraces, carefully located for comfort and shade from wind and sun. Professionally designed kitchens and sprawling living/dining spaces are handmade for entertaining family and friends. Homes built on the ironshore will spotlight one-of-a-kind, 60-foot serenity pools built into the rock, with glass ends that create the feeling of dropping off into the ocean. The Lagoon Villas offer the option of a butterfly-style roof. In the spirit of Windward Development’s skill at “reimagining” existing sites, a third neighborhood will include homes built around a specially created beachfront lagoon. This bay will mimic island favorite Sapodilla Bay—a shallow area ideal for swimming, wading, sunbathing and especially safe for children, being motorsport-free. 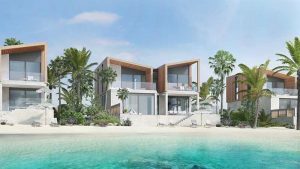 Malibu Beach inspired, three- to five-bedroom homes here will include beach access, a lagoon-front pool and deck and some with a private boat dock. Nearby will be 38, two- to three-story townhomes (called Boathouses), which can include distinctive rooftop terraces and a dedicated boat dock off the back deck. The last neighborhood of the South Bank community will include 12 to 16 waterfront condominiums, offering something for every resident’s preferred lifestyle. Being surrounded by water, water views, sunrises and sunsets, South Bank owners will quickly appreciate the ease with which they can hop onto their boat or access the development’s boat concierge service for cruising and fishing on the Caicos Banks. With the entrance to Juba Sound just around the corner, kayakers and paddleboarders have an ideal starting point to explore the mangrove systems nearby. Windsurfers and kite boarders need only take a short hike to the east for Long Bay Beach’s world-renowned playground. Dive Provo operates scuba diving charters from the marina. Windward Development boasts an excellent track record when it comes to exclusive waterfront communities. In 2016, they launched Blue Cay Estate in the Leeward area of Providenciales. The 15-acre project involved excavation and construction works to create the 870-foot long, 85-foot wide Blue Cay Canal. As a result, each of the 15 homes in the gated community features water frontage. Ivor Stanbrook, director of Windward Development, explains why this was so exciting, “Now, each of the Blue Cay estates has a dedicated boat dock, unique water view, and direct access to the pristine waters and distinctive cays of the north and south shores of the Turks & Caicos Islands. Using very similar principles and processes at South Bank will help us create a special canvas for this new destination. ” In keeping with Windward Development’s goal of utilizing cutting-edge solutions, the company worked closely with global experts in the marine engineering and construction fields to include protective structures to minimize environmental impact. The luxury residential development was so well-received that the homes sold out within just over two years. The new South Bank project will utilize the same team of developers, architects, builders and marketers and anticipates similar success. As Ingo Reckhorn explains, “We like to foster a partner network with individuals that share a similar spirit and philosophy as Windward Development; when you find professionals you work well with and trust it leads to successful collaboration.” Architects Blee Halligan are known for bold, distinctive and versatile buildings and interiors, with studios and workshops in East London and Providenciales. A look at the plans reveals they spared no creativity at South Bank, whether in the use of natural cladding materials on the buildings to the smart, contemporary streetscapes of the townhome area and use of indigenous vegetation. The Launch Boathouses will be built around a central pool. Windward Development Company, whose principals include Ivor Stanbrook, Kyle Smith and Ingo Reckhorn, believe the process of building and owning your waterfront home—whether it is your first or one of several in your portfolio—should be satisfying from start to finish. Many property owners prefer to leave the day to day details to a management company, especially if they plan to rent out their villa or condominium when they are not on-island. For South Bank, as with Blue Cay Estate, Grace Bay Resorts will manage the resort and a villa rental program for owners. Grace Bay Resorts are the TCI’s leading resort and villa operators, offering quality service and attention to detail. According to South Bank’s developers, the infrastructure works are slated to commence imminently, with the first of the ocean estates to start construction by summer. For more information, visit www.livesouthbank.com or call (649) 231-0707.